TONOPAH — The planned Interstate 11 highway project connecting northern and southern Nevada, with what local officials hope will include a Tonopah area exit/entrance, isn’t the only major transportation effort on the town’s radar. The town board voted 5-0 on Jan. 11 to write a letter in support of a study that would look at the possibility of constructing high-speed rail between Las Vegas and Reno. Proposed stops on the passenger and freight Vegas-Reno rail would include Pahrump, Tonopah, Hawthorne and Carson City, project leader Rob Lauer said in a briefing at the Tonopah Convention Center. The estimated $10 billion proposed project is in its early stages, with Lauer saying he is trying to build political support and get feedback. Plans include presenting a bill draft request for $20 million from the state for study work. The bill draft would be presented to the 2017 Nevada Legislature that meets starting in February in Carson City. A website — silverbulletnevada.com — is up and provides project information and a video. During his roughly 35-minute presentation in town, Lauer of Silver Bullet Nevada rail systems outlined his vision for the proposed 500-mile train route. 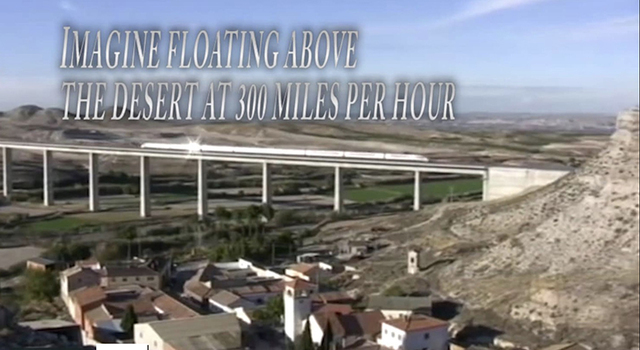 The electromagnetic rail, elevated above the desert floor to reduce the environmental impacts, would travel at maximum speeds of up to about 300 mph with trains running in two directions. One train would run from Reno to Vegas while a second train would run from Vegas to Reno. Each would stop in Pahrump, Tonopah, Hawthorne and Carson City. “I could see Tonopah, for example, being a destination” for locating high-tech type facilities “where it’s going to lower costs,” to conduct business compared with other areas. He mentioned data center company Switch as an example of the type of business envisioned. “Being able to transport people back and forth so quickly really is going to open up our interior to more development,” Lauer said. Exact stops within each of the communities along the proposed line have not been determined, along with items such as how many passengers a train would hold and the cost of a passenger ticket. Lauer, however, envisions the Las Vegas stop/start site as being near the proposed stadium that would house the NFL’s Oakland Raiders, who are eyeing a move to Vegas. “So you could all get on the train, and go to the stadium, watch a game, and come back in the same day,” he told Tonopah Town Board members. Lauer, owner and president of Newsmax TV of Las Vegas, said the high-speed rail project would not involve tax dollars. Instead, he proposes the federal government donating land and vacant buildings as part of a financing plan to build the rail. Vacant federal buildings, which Lauer said total 45,000 around the country, could be donated and then leased or sold, he added in an interview, with the money going to finance what would be a privately funded and run rail in Nevada. To further that goal, Lauer requested the letter of study support to the state of Nevada and governor’s office to fund the studies. If the studies conclude the high-speed rail should be built, they then would be submitted to the administration of incoming President Donald Trump for consideration. Donation of federal land/unused federal buildings are described as a “funding mechanism” in the rail financing equation. The buildings also would be leased or rented out with the incoming funds used to build the rail, he added. 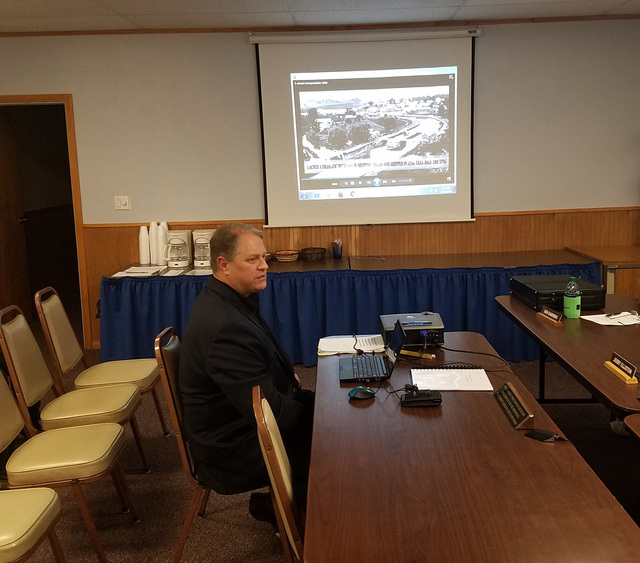 Lauer told the town board the proposed private rail project comes as the incoming Trump administration is considering an infrastructure plan for the country. On the campaign trail, Trump called for vastly improved transportation facilities. Lauer envisions the rail taking three to five years to build. Lauer outlined the industrial opportunities the rail would bring. No funding is being requested from Tonopah or Nye County for the study work. Lauer said he also was waiting for a letter of support from the Nye County Commission for the study.